There are many causes of hair loss. Stress and iron deficiency are some of them. Hair needs nutrients. The protein and iron found in many foods are the keys to strong hair. 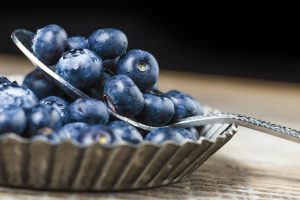 When the cause of hair loss is not genetic, we can consume several foods that help us strengthen our hair and provide it with nutrients and vitamins, which will prevent excessive hair loss. So now let’s get to know some foods that help prevent your hair from falling out. 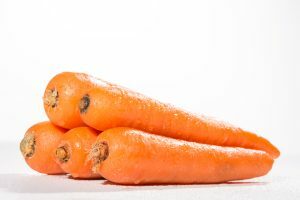 Easy to find, carrots are rich in beta-carotene, a nutrient that helps prevent hair loss. Vitamin A, found in carrots helps in the process of cell renewal, including scalp cells and assists in the production of sebum, a compound that prevents the dryness of the hair. There are other nutrients and minerals such as vitamins K, C, B6, B1, B3, B2, fiber, potassium and phosphorus, which role is to maintain strong, healthy hair. Taking a carrot juice every day will reduce hair loss. If you prefer, you can cook them or add to the salads and soups. They contain large amounts of folic acid, which is essential for the hair to grow stronger. Iron, beta-carotene, folic acid and vitamin C present in this vegetable, help maintain the health of hair follicles. 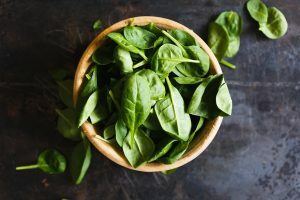 Like other dark green leaves, Spinach is an excellent source of iron, which stimulates growth and strengthens the hair. Deficiency of iron can cause hair loss. They provide the nutrients needed to stimulate hair growth. 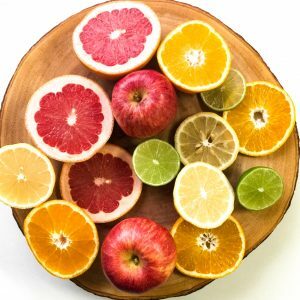 Vitamin C, found in this food group, is involved in the synthesis of collagen and helps the iron to be absorbed. Have high doses of vitamin C, and this is essential to have healthy and strong hair. The lack of this vitamin can make the hair brittle. 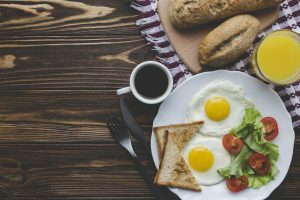 Eggs are an excellent source of protein. Also, it also contains biotin, minerals like zinc, selenium, sulfur, and iron that help control hair loss. Biotin belongs to the B-complex vitamins and is essential for hair to grow healthily and glow. Eggs are also rich in zinc, essential for the health of our hair, so do not hesitate to consume them. Provides proteins that the body needs for healthy hair growth. 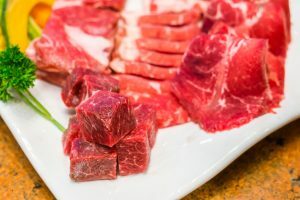 Beef is an essential source of B-complex proteins and vitamins, also iron and zinc. All these nutrients are perfect to combat and prevent hair loss. Contains fatty acids that help hair growth. 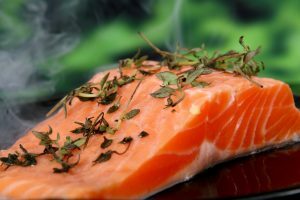 Salmon is rich in Omega-3 another nutrient that strengthens the scalp. They are full of proteins, fibers, B vitamins, zinc and minerals that are essential for the hair growth. 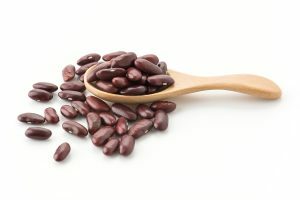 They also contain a good amount of iron, which as you already know, is necessary to prevent hair loss. Magnesium is one of the most important minerals for our body. Its deficiency has also been linked to hair loss. 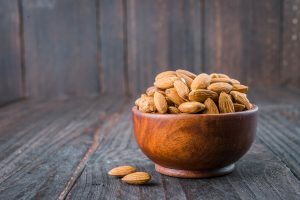 Almonds, being good sources of this mineral, are good foods for hair loss. It also plays a vital role in strengthening the hair and preventing breakage. Walnuts can be eaten in snacks between meals and can also be added to salads, desserts and hot dishes. They are good foods for hair loss because they contain omega-3 fatty acids, considered important for healthy and soft hair. In January 2015, it was made one of the most promising research. During the study, participants received a nutritional supplement containing omega-3 and omega-6 essential fatty acids and antioxidants for 6 months. The results showed that 90% of the participants experienced a reduction in hair loss. Also, 86% of them reported an improvement in hair growth and 87% reported thicker hair. 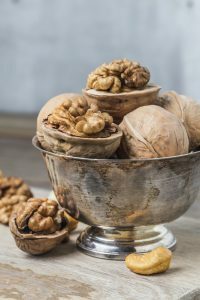 Walnuts are also rich in zinc, iron, selenium and vitamins B1, B6 and B9, stimulating hair growth and significantly reducing hair loss. Also, they are rich in biotin, vitamin E, protein and magnesium strengthening the hair follicles and maintaining the health of the scalp. It is an excellent source of beta-carotene, which the body transforms into vitamin A, which helps prevent hair loss. 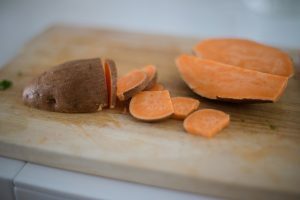 Sweet Potatoes are one of the foods against hair loss that you should include in your diet. Its composition is rich in iron and proteins that stimulate hair growth and maintain the health of the scalp. They also contain beta-carotene, potassium, and magnesium, reducing stress levels, which in turn prevent hair loss.